The Landing Gear Mechanism Trainer is very valuable equipment for the hands-on training for aircraft maintenance training schools. It is essential to ensure that trainees not only understand the theory but they are also well prepared to maintain the landing gear system in the best possible manner, and in compliance with the prevailing safety standards. Our Trainer Model AS-03 is a very effective handson training system for landing gear system. The Landing Gear Mechanism Trainer Model AS-03 includes all assemblies and components of the standard hydraulically operated landing gear system. Two types of trainers are available; Model AS03/3 comprises of three wheels comprising two main landing gears and one nose gear, and Model AS-03/1 has one wheel. Both models depict the landing gear mechanism as found in actual aircraft. The model is mounted on a moveable stand to facilitate easy positioning of the trainer for a clear view from all directions. Model AS-03 includes complete wheel and tire assembly with hydraulic brake system, including master cylinder and brake pedal. The control unit contains control throttles for landing gear and hydraulic flap operation. Three indicators show up, down, and in-transition conditions. 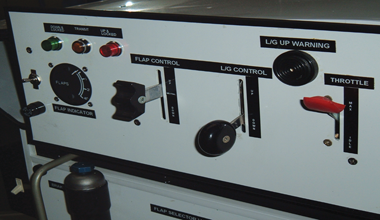 A throttle warning horn is also mounted on the control panel. All components are mounted on the display panel to provide a clear view to the students. System powered by either 220vac 50hz or 110 vac 60hz, single phase. 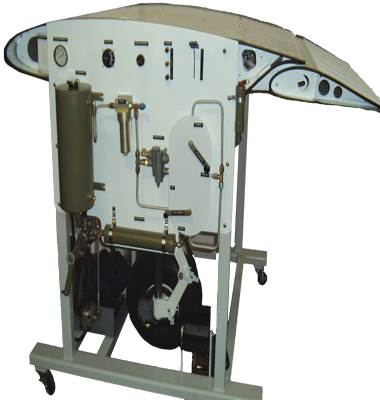 All components are mounted on the display panel which makes the system a great tool to demonstrate a typical hydraulic system operation, in addition to the landing gear operation. The system includes electrical motor & a mechanical pump with all associated components (pressure regulator, relief valve, check valves,reservoir and filter assembly). The system also includes a full function brake system with parking brake operation. The landing gear trainer is supplied with an interactive computer-based training (CBT) package at no additional cost.